By and large I’ve given up on radio unless I know the station (KKFI here in Kansas City, KCRW in LA, WKCR in New York). On a recent road trip though I was passing through Nashville while on the phone with a friend and he told me to turn on the radio—so happy he did. 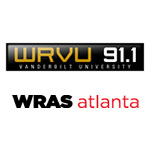 I not only discovered WRVU but I tried the same thing in Atlanta and discovered WRAS. WRVU is currently fighting for their existence, if you have a moment visit their site and take a listen… then take action.